RETURBO, the market leader within the secondary market for e-commerce products, is publishing both its (provisional) financial figures for the first half of 2015 and additional financial information for the fiscal year of 2014 in this update. The first half of 2015 was very successful for RETURBO, and we met all of our targets. In fact, we increased revenues within the secondary market by approx. 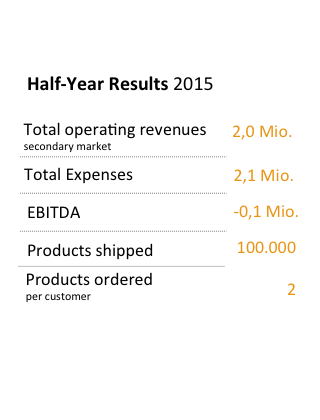 230 % compared to the same period last year, generating revenues of approximately €2.0m in the first half of the year. This significant increase in revenues was due to an increase in monthly revenues, which increased by over 60 % in 2015 alone (from January through June). An analysis of the provisional financial statement for 2014 also shows that RETURBO's focus on the high-margin secondary market has been the right decision. 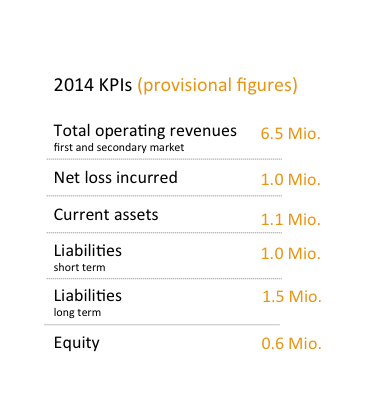 Still, RETURBO's revenues in 2014 were largely due to sales activities within the first market. 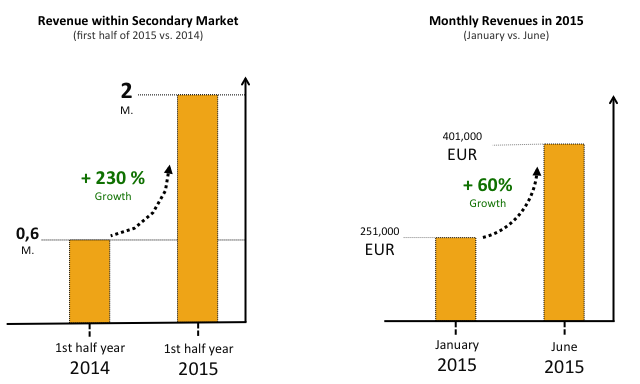 In total, we generated more than €6m in revenues in 2014 through sales within the first and secondary market (€2m of which were due to the secondary market). As margins within the first market were relatively unattractive, however, we started shifting our main focus to the high-margin secondary market. Because of the considerable investments we made in the RETURBO secondary market platform, our expenses in 2014 surpassed our revenues, and we posted a net loss of approx. €1m for the year. Still, there is no need to be concerned about this net loss because our investments (in IT, inventory management, and our logistics center of approx. 10,000 m² with >75 % remaining capacity) have already started benefiting us (by increasing revenues and margins and enabling us to reach breakeven point) and will keep doing so in the future. We financed part of the investments through borrowed capital (provided by IBB and Harbert), which is reflected in the corresponding long-term liabilities. The fact that RETURBO has already received part of its funding in the form of borrowed capital (not in the form of equity, which is more common among start-ups and would dilute Companists' investments in the future as well) shows that our business model is rather sophisticated. 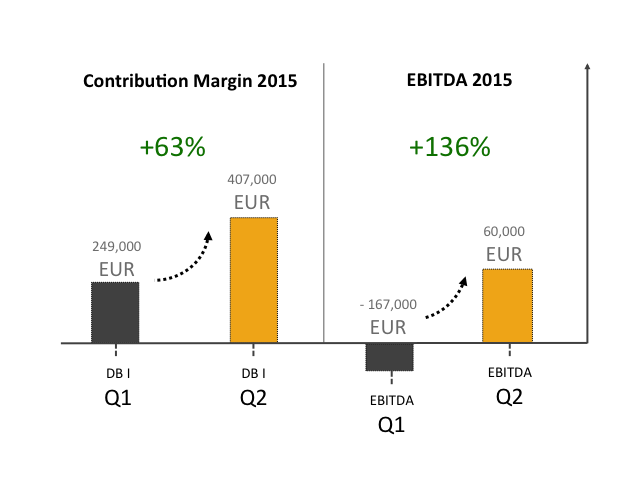 A significant increase in the contribution margins by more than 60 % and the fact that we reached breakeven point (both in Q2 2015 and in every single month of that quarter) prove that our focus on the secondary market has been the right decision. Consequently, we achieved positive EBITDA of approx. 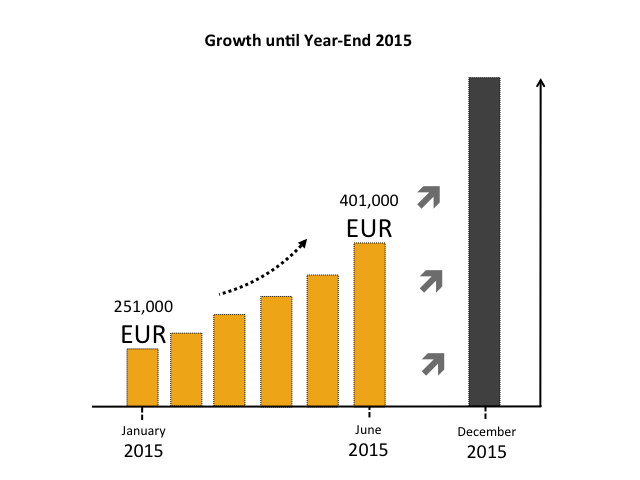 €60,000 in Q2 2015. As we have reached breakeven point, have remained profitable, and are running a profitable business regardless of a certain funding amount, RETURBO is a relatively low-risk investment. The successful figures for the first half of this year will provide a very solid basis for meeting or even surpassing our targets for 2015. This assumption is supported, for example, by strong monthly growth even in the historically weak months of summer (the holiday season) because the strongest months for the e-commerce sector tend to be in the last quarter (the Christmas sales period), which is still ahead of us. We would like to thank all investors for their confidence and are looking forward to collaborating with them in the future!